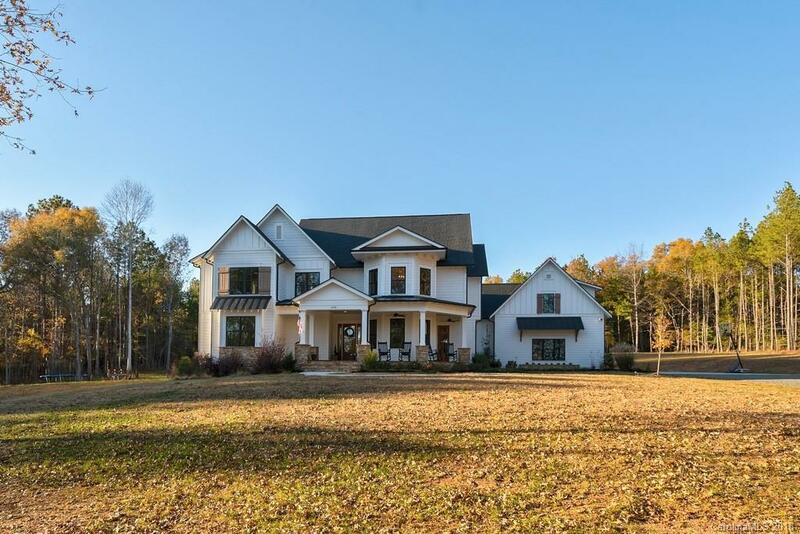 Tucked away off the road, is 1139 Mooreland Wood Drive, a New Old Home Builder, custom built 2016 new home. It is apparent upon driving up the driveway, these owners put much thought into creating a home conducive to modern living. The crisp white hard-board siding with black shutters and stone accents is reminiscent of new ideas and designs one finds in today’s construction. A front porch with impressive front entrance and a side entrance offers residents of the home direct access to an oversize laundry/mud room leaving outdoor elements where they belong, as well as, friends a welcoming entrance through the double front glass and solid wood doors into a two-story foyer. Once inside, it is obvious the attention to details was observed when building. 10’ ceilings, extensive trim work, wood beams and character grade Hickory floors are just a few of those details. Three areas of this home stand out, among the rest. In particular, the kitchen which is open to the great room and dining area and features honed granite, subway tile back splash & custom cabinets with special touches such as hidden pullout spice racks & soft return drawers. All Kitchenaid stainless steel appliances and a very popular farm house sink with Rohl faucet. The adjoining dining area hosts a large farmhouse table (negotiable) surrounded by shiplap walls and windows. If not enough dining here, the large breakfast counter provides additional room. The second area of interest and given considerable attention, is the very large mud room/laundry/pantry/hobby room. Honed granite counter tops provide plenty of folding space while custom cabinets with fold out laundry hamper and a drop station with bench drawers, cubbies and hangers are ideal for all the outdoor clothes and boots. The sliding barn door on the pantry in this area just add additional character and practicality. Whether hobbies, an office or home schooling, this adjoining room is set up with any of those activities in mind. The second-floor bonus rom can also be accessed from the laundry area. Plumbed for a bathroom or possible entertainment area, the sizable bonus room offers many options away from the rest of the living spaces. The third area most impressive is the second-floor master suite. The bay window area provides plenty of reading room, two walk-in closets with built-in cabinets and shelves along with the incredible master bath with limestone counters on the dual vanity, freestanding soaking tub and frameless glass and tile shower with both a rain head and handheld are all bright and open areas. All guest bedrooms are generous in size, including the main floor guest room. One offers built-in bunk beds, two offer built-in window seats with storage areas. The great room is warmed by the fireplace and has direct access to the covered back deck. 11.79 acres is a great place to play, design your dreamscape yard, set up a farm for your horses or fish in the pond. Recent clearing of 3 acres will get you well on your way to creating your ideal play area. Already graded for a back-yard pool. Ready to move in, get settled in the home and start your outdoor projects. When not landscaping and gardening, enjoy long walks or rides on the community trails or spend time floating, canoeing or fishing in the 9-acre community lake.